Recent advertisements have focused on the use of Omega-3 supplements for horses, usually containing flaxseed meal, rice bran oil, vegetable oil or fish oil. Studies in horses have found many health benefits with supplementation of Omega-3 fatty acids in the diet. Dietary fats serve as carriers for fat-soluble vitamins A, D, E and K, and supply the essential fatty acids (EFAs), linoleic (Omega-6) and alpha-linolenic (Omega-3) acid that cannot be synthesized by the body. While Omega-3 fatty acids control the inflammatory response in the body and have positive health benefits, Omega-6 fatty acids aid pro-inflammatory processes and some human medical research suggests that excessive levels of Omega-6, relative to Omega-3, may increase the probability of a number of diseases. It should be noted however that both Omega-3 and Omega-6 fatty acids are essential – cannot be synthesized by the horse and must be consumed in the diet. Although the exact EFA requirements for horses have not been established, they have been demonstrated as necessary for many normal bodily functions. Deficiency of EFA in humans and animals includes hair loss, skin problems, and impaired immune and reproductive function. They also synthesize hormones and transport oxygen from red blood cells to tissue, and help control inflammation. Significant correlations between high blood plasma ratios of Omega-3: Omega-6 fatty acids and good hair coat condition, and low blood plasma ratios of Omega-3: Omega-6 fatty acids and poor hair coat condition were reported in a study with Thoroughbreds. 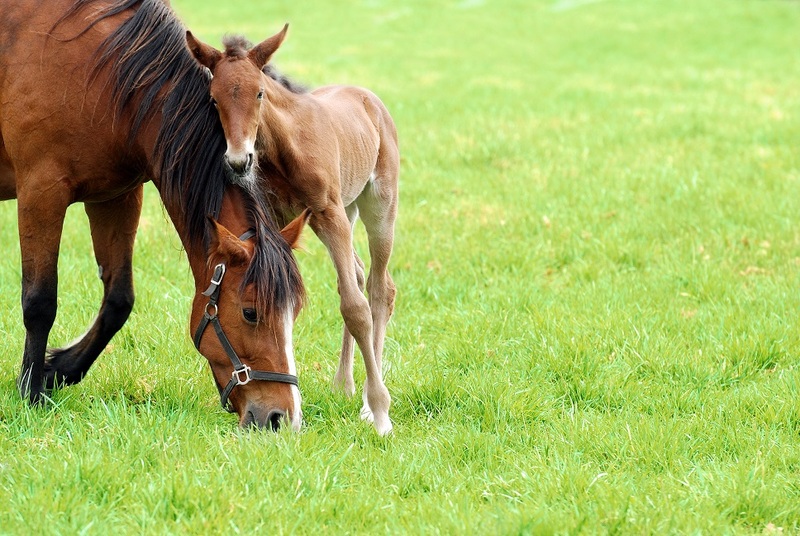 Other equine research studies with Omega-3 supplementation have also had positive results. Breeding stallions supplemented with Omega-3 fatty acids have shown increased sperm concentration and motility in several studies. Omega-3 supplementation of pregnant mare diets resulted in a change of the milk fatty acid composition. Pasture grasses and hay, although containing only 2% to 3% fat, have greater concentrations of Omega-3 than Omega-6 fatty acids. Cereal grains, such as corn and oats, along with sunflower and safflower seeds contain much higher levels of Omega-6 than Omega-3 fatty acids in reference to their total fat content. Flaxseed oil is the most concentrated plant source of Omega-3 fatty acids. However, there are three types of Omega-3 fatty acids; α-linolenic acid (ALA) (found in plant oils like Flax), eicosapentaenoic acid (EPA) and docosahexaenoic acid (DHA), both commonly found in marine oils, including algae, fish and phytoplankton. As we mentioned above, not all Omega 3’s are the same, we have ALA, EPA and DHA. There is NO EPA/DHA in any of the commonly referred to plant sources touted for high Omega 3’s. Unfortunately, the body (horse, dog, cat human etc.) cannot utilize ALA directly for the benefits listed above. It must first be converted to EPA and DHA. This conversion rate is very poor – some studies have shown it to be less than 1% in horses (less than 1% of the ALA amount is converted to EPA/DHA). So in order to be reaping the benefits listed above for Omega-3 fatty acids, we must be feeding marine sources that give us direct sources of EPA/DHA, alleviating the need for the conversion. For more information, please visit standleeforage.com.